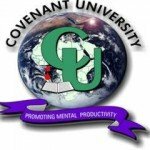 Covenant University MBA postgraduate degree programmes admission form is out for the 2015/2016 academic session on both full and part-time basis. The management is inviting suitably qualified candidates to apply for her MBA full-time and part-time postgraduate degree programmes for the 2015/2016 academic session. For information regarding available programmes, method of application, closing date and other relevant things intending applicants need to know, kindly download the 2015/2016 MBA Programme admission advert from here.